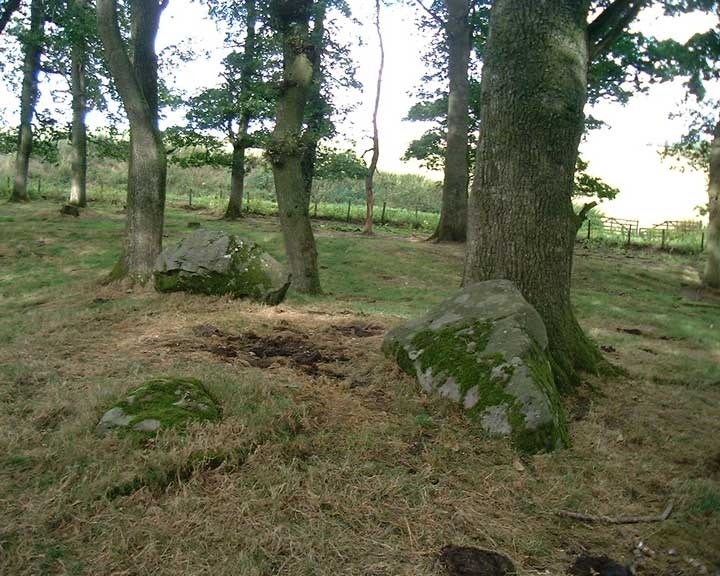 Here, close to the Staredam stones, is what appears to be the remains of a four-poster stone circle. There are three stones on the corners of a rectangle – the place where the fourth stone should be appears to have suffered soil erosion, so the stone has maybe toppled down the hill or been moved. There are a few likely candidates nearby. There are 2 larger stones, and one smaller. The 2 large ones are aligned N-S, while the smaller one is aligned with one of the larger ones E-W. The size of the rectangle is approximately 3m N-S by 1.5m E-W. The stones stand on a small mound on top of a big spur of land, which looks like it might have been accentuated artificially, although it’s too big to be entirely man-made. Muirheadstone is in the parish of Auchtergaven and the county of Perthshire.